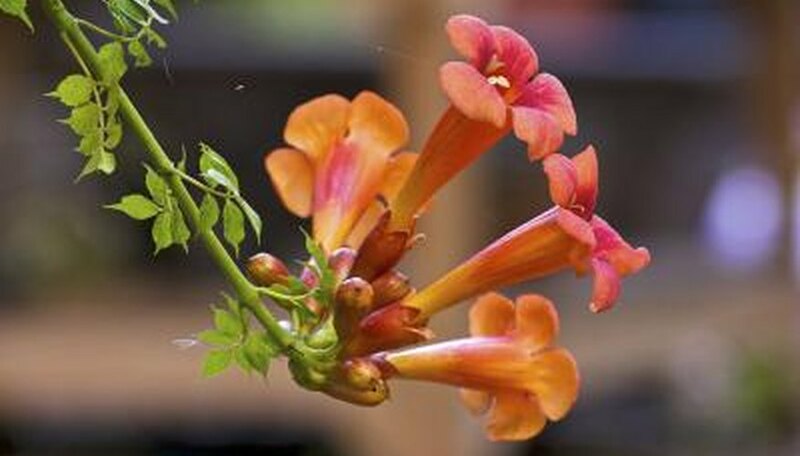 The hummingbird vine (Campsis radicans), also known as trumpet vine or trumpet creeper, comes by its name naturally as hummingbirds are one of the few animals that can reach the nectar inside its tubular bloom. In fact, the hummingbird vine depends on hummingbirds and bees for pollination. This vigorous climber is native to the Southeastern United States and thrives in full sun in U.S. Department of Agriculture plant hardiness zones 4 through 9. Plant hummingbird vine in a location that receives six to eight hours of direct sunlight per day. Although the foliage thrives in shadier locations, flower production is most abundant in full sun. Hummingbird vine blooms from midsummer until fall, adding brilliant color to the landscape with its orange to scarlet blooms. Hummingbird vine is not picky when it comes to soil and thrives in nearly any type, but it grows best in lean to average soil. This means you don't need to worry about enriching the soil for hummingbird vines once they establish themselves. Adding organic matter to the planting hole, at a rate of one part organic matter to two parts soil, at planting time typically provides enough nutrients for the vine. Hummingbird vines do require well-drained soil and suffer in soggy soil. The hummingbird vine thrives with 1 to 2 inches of rain per week but tolerates drought well. Water deeply to moisten the roots and surrounding soil when planting, and water again when the soil feels dry 4 to 6 inches below the surface. Once established, the vine will do well with only occasional watering during dry spells. Likewise, the hummingbird plant does not require supplemental fertilizer as too much fertilizer causes lush foliage with few blooms, says the National Gardening Association. The hummingbird vine can reach heights of 30 feet or more in the wild as it climbs upward toward the sky. The climbing vine produces aerial rootlets that cling to anything in its way. Although it will climb trees and shrubs, it benefits from a trellis or fence for support. Controlling the size of the hummingbird vine is necessary to prevent it from overtaking nearby plants. Prune it in the spring to maintain its size and shape, wiping pruning tools with rubbing alcohol to make sure no disease is spread. New blooms will appear on the new growth after pruning.